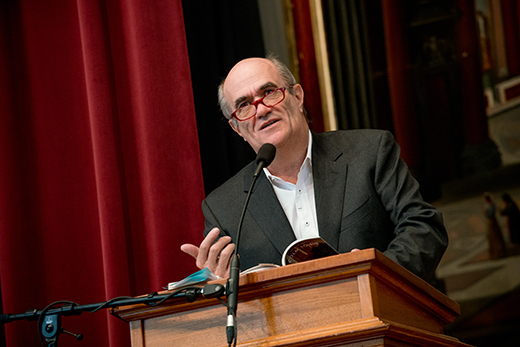 Colm Tóibín has been recognized internationally as a versatile novelist, short story writer, playwright, poet and screenwriter. Tickets for award-winning Irish writer Colm Tóibín’s 2017 Ellmann Lectures in Modern Literature Nov. 12-14 will be available to the public beginning Thursday, Oct. 5. Tóibín’s lectures, titled, “Writers and Their Fathers: Wilde, Yeats, and Joyce,” will be held at Glenn Memorial Auditorium, 1652 N. Decatur Rd. Free parking is available in Fishburne parking deck, 1672 N. Decatur Rd. Books will be for sale at all events. Tóibín is recognized internationally as a versatile novelist, short story writer, playwright, poet and screenwriter. The film adaptation of his sixth novel, “Brooklyn” (2009), about a young Irish immigrant, earned three Academy Award nominations in 2015 (Best Picture, Best Adapted Screenplay, Best Actress). Sunday, Nov. 12 – 5 p.m.
Monday, Nov. 13 – 8 p.m.
Tuesday, Nov. 14 – 4 p.m.
Tuesday, Nov. 14 – 8 p.m.
Tóibín joins a distinguished roster of authors that has made the Ellmanns one of the leading literary lectures series in the English-speaking world. Ellmann Lecturers include Nobel Prize laureates Seamus Heaney (1988) and Mario Vargas Llosa (2006), Salman Rushdie (2004), Umberto Eco (2008), Margaret Atwood (2010) and Paul Simon (2014). Emory established the biennial Richard Ellmann Lectures in Modern Literature in 1988 in honor of Richard Ellmann (1918-1987), who served as the university’s first Robert W. Woodruff Professor from 1980-1987. The biographer of James Joyce and Oscar Wilde, Ellmann was one of the 20th century’s greatest literary biographers and critics of modern Irish, English and American literature. He enjoyed eminent domain among the interpreters of W. B. Yeats, James Joyce, Samuel Beckett, Henry James, T. S. Eliot, Wallace Stevens, and other modern authors. His public lectures were unparalleled in their appeal to a worldwide audience of readers. Ellmann always spoke in a language that invited the reader to share his or her personal engagement with serious literature.